With the kind permission of the Irish Herald, <http://www.irish-herald.com> we are pleased to offer recently-published Irish traditional music and Irish folk music CD reviews by Paul Carr. To read many of Paul's CD reviews of 2002, and a bit of a bio, click here. This classic CD ranks among the finest examples of pure piping that you are likely to find among the ranks of piping CDs in the last few years. And it's no wonder, as Neil Mulligan comes from a Dublin family with musical roots in Co. Leitrim and four generations of musicians behind him. Mulligan's piping is a very melodic piping, with minimal use of the drones as a backdrop or as an accent. While he often has a weeping note behind the melody, it never gets in the way of the tune. The CD features a number of less well-known tunes, along with the crowd pleasers, like the beautiful and intricate The Salamanca, Bonny Kate, and The Copperplate. There is also the famous reel called Lucy Campbell, on loan from Scotland indefinitely, as well as the Miss Monaghan's. Both these pieces give a talented piper a chance to shine, and shine Mulligan does. One of the more unusual tunes is a slow air called Dark is the Color of my true Love's Hair, normally presented as a song. Here Mulligan The air of the song had been lost in Ireland, but was brought back in the 1950's by Willie Clancy after hearing it from an American folk singer. One of the brightest, somewhat bouncy jigs is The Leitrim Slashers, also known as The Kinnegad Slashers. Mulligan gives it that modest, relaxed tempo that a jig deserves, and the tune comes out as a beautiful little gem under the fingers of the craftsman. Neil Mulligan "Barr na Cúille"
Label: Spring Records; SD 1022; Playing time: 45.28 min When I heard the sound of the pipes, everything left my body - all that remained was my soul and my ears to hear the music. Your music is wings to a human soul. (Tarmo Urb of Estonia) Born in Phibsborough, Dublin, in 1955, Neil Mulligan (see also www.uilleann.nl/homepages/neillidhMulligan/), carries on the piping tradition of Co. Leitrim. Neil was first taught by his father Tom (1915-84), and later by Leo Rowsome (-> FW#21). His childhood home has been dubbed the Rotary Club by Séamus Ennis since it was perpetually frequented by musicians. 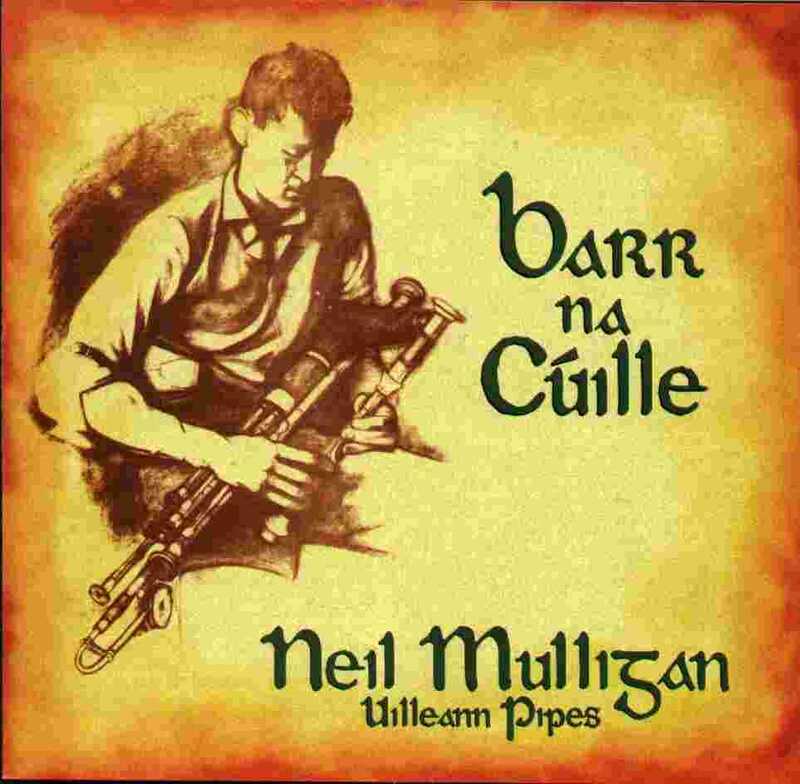 Neil's debut solo album "Barr na Cúille" has been originally released in 1991, its original compositions are dedicated to his father's home at Currycramp, Bornacoola, Co. Leitrim, as a tribute to the home place and its legacy. 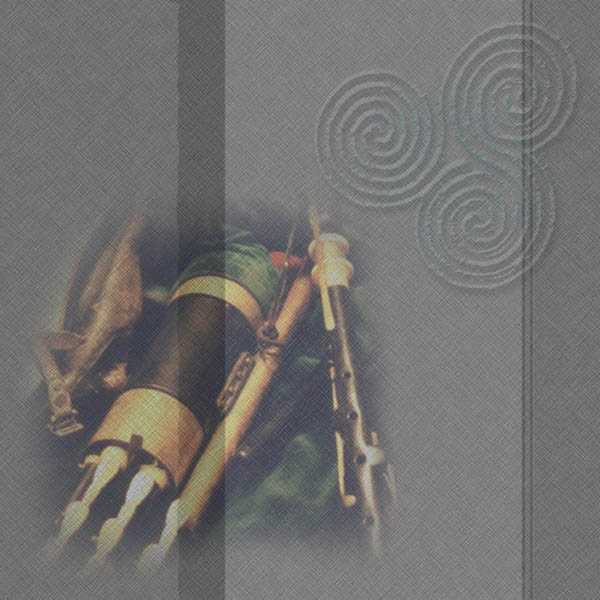 It has been already described as one of the definitive recordings of uilleann piping. Neil plays Ennis's Brogan pipes in concert pitch, and a flat set in B which gives a gentler tone and sound level. His piping is fluid, the regulators tastefully used. Exceptionally, there are six slow airs included. "Port na h-eala air an tráigh" (The Song of the Swan on the Beach) has been adapted from Ennis's singing. Neil has learned the golden rule, as Liam O'Flynn once described it: I listened to [Ennis] playing slow airs, and I couldn't make out what he was up to. Then he told me the stories behind the tunes and, through him, I discovered the words to the airs and his piping began make perfect sense. That's where his genius was - in bringing the words into the music. Neil remembers well the early days of the traditional music revival and sighs: There's nowhere like Slattery's today. And music is all speeded up - everybody seems to have a bouzouki or guitar player in tow. Nowadays, his brother Tom runs the Cobblestone pub in Dublin's Smithfield area, where you may find Neil as well, certainly not in the neon lights of traditional music PR, nor is it associated with the buzzwords of commercialism. (F. Vallely) But everywhere else where the pure drop is appreciated. Amongst other things, I'm a failed piper. After listening to Neil Mulligan's playing, I'm almost glad; I'd probably have died of frustration trying to achieve anything like such skill. Neil (aka Neillidh) Mulligan was 11 years old when he had his first lessons on the uilleann pipes from his father, and was later taught by the great Leo Rowsome. Seamus Ennis was a friend of the family, and a great influence on the young piper. Neil is a founder member and past chairman of Na Piobairi Uilleann, the pipers' association. On "Barr na Cuilie", he plays a flat set in B, a key more commonly used by pipers in previous centuries. This gives a warmer, mellower, tone than the more common concert pitch sets. His piping is tight and controlled, with sensitive ornamentation and sparing use of regulators, a feature of Seamus Ennis's playing. There's a good mix of old and new tunes, including 6 slow airs, one of which is from the Isle of Barra. Neil learned this from Se' amus Ennis's singing. Unusually, there are only 4 sets of reels. There are 3 sets of hompipes, 2 of double jigs, and a tasteful pairing of the much-neglected slip jig, "The Whinny Hills of Leitrim" with "Drops of Brandy". The title reel is self composed, and dedicated to his father. It's a valuable addition to the store of piping tunes. Sean Donnelly's liner notes are concise and informative, pointing to the Scottish origin of many of the tunes, and similarities between many of them. I'll stick my neck out and say that this is one of the definitive recordings of uilleann piping. I played it to one of my piping friends. The poor man kept shaking his head and saying, "You just can't do that on the pipes!" Neil Mulligan can, and he does! neillidh@eircom.net for further info. on ordering. etc.